Microsoft has applied for a new patent on a PC stylus that recharges via a magnetic connection. The filing was noticed by the site Patently Mobile and it reveals what we may expect from the next round of Surface devices. In plain English instead of just sticking to the device, it will also charge the pen. It is also observed that the charging base is not standalone and instead looks to be a module to be built into larger hardware. 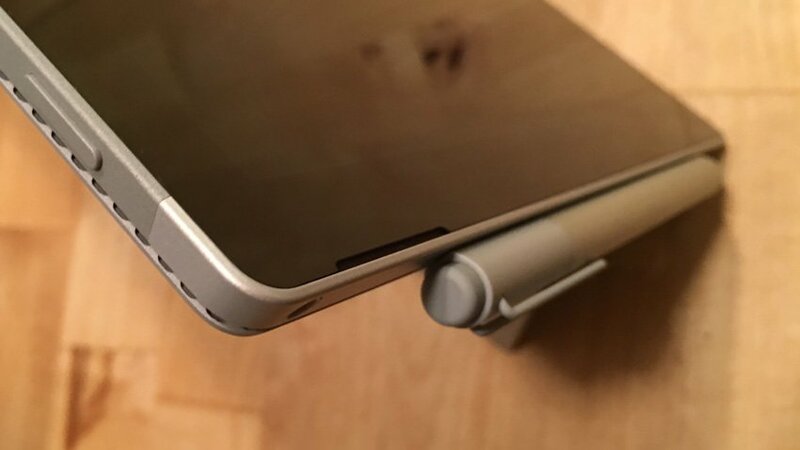 Starting with the Surface Pro 4 and Surface Book Microsoft let users attach the Surface Pen to the side of the device via a secure magnetic connection. The solution still results in the ability for the pen to come loose in a bag or be knocked off, but it is more elegant than the previous loop-sticker that was offered. Microsoft has stated earlier that a superior in-body solution is not possible because the Surface is thinner than the pen. However, the current pen is still very much like the old one that requires a AAAA battery to be replaced every few months. This design stands in contrast to the Apple Pencil, which requires the users to recharge the stylus awkwardly by plugging it directly into the iPad Pro. Apple has been heavily criticized for the bizarre charging method, and Microsoft may be trying to patent their way around the problem before Apple. It is not entirely clear why Microsoft would need to make the pen rechargeable as the AAAA battery can last users six months or even up to a year. Microsoft may simply be getting a patent to an obvious solution to Apple’s problem, or the next generation Surface Pen may require more power. Either way, the patent fits right in with the Surface esthetic and we would not be shocked to see it arrive with the Surface Pro 5 and Surface Book 2. Those devices are not expected until fall 2016. However, a refreshed Surface 3 in the form of Surface 4 will likely come in the spring or early summer.